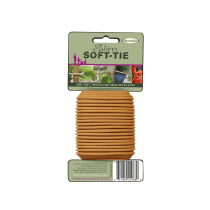 Protect the stems of your plants from bruising and breakage with Soft-Tie, an innovative, award-winning multi-purpose plant and garden tie available in two different widths, and two different natural colours (soft green and woody). 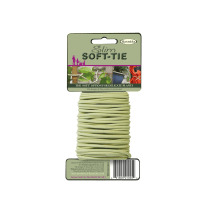 Soft-Tie has an inner core of galvanised steel wire, which gives it its strength, and an outer coating of a rubber compound, which cushions and protects plant stems. It is easily cut with a pliers and is secured with a quick twist. It is long-lasting, does not rot, and can be washed and re-used. 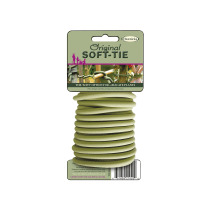 Soft-tie an be used beyond the garden, for tying, fixing and securing - The perfect handyman's accessory! 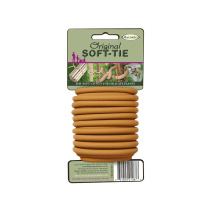 Keep it neat and discrete- choose the Woody Soft Tie to blend in with woody stems and Original for green stems.